Shadow - Brian Enos's Forums... Maku mozo! Or just go through the posts on this forum (PCC) and read the problems members have experienced with each (MPX vs GMR-15). To each his own. Another thought is to google "Sig MPX problem" and "JP GMR-15 Problem" and consider the results. He may be able to help you. 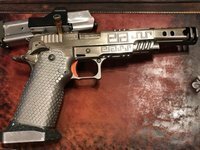 Shadow replied to RadarTech's topic in Match Announcements - Pistol Only - USPSA, IPSC & Misc. Anybody heard anything besides crickets? Stages? Match booklet? 3M spray adhesive. Spray tape, spray some in a cup, dab on the grip with a q-tip. Let dry 2-3 minutes, stick together. I see we are on the same squad for CGGR Saturday. Look forward to seeing you there. Welcome! Which local USPSA matches are you shooting? Slide racker with sideways c-more - left or right side? Its an individual thing. Try both and use what works for you. I prefer an 8.